Info "Search the house for an item that matches the example!" 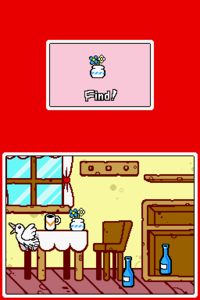 Housewares is a microgame found in the Touch Training stage in WarioWare: Touched! The objective of the game is to tap the object on the bottom screen that matches the one on the top screen. If the player chooses a wrong object, they lose. During the microgame, a cat or bird will move around the screen, distracting the player. Tapping the animal causes it to stop moving for a short period of time. This game has twice the time to complete than the others (eight seconds). 1st level difficulty: There are a few objects to choose from. 2nd level difficulty: There are several objects to choose from. 3rd level difficulty: There are many objects to choose from. This page was last edited on April 6, 2018, at 21:18.